The M&Ms people could be getting a little desperate with the new limited edition flavors. I just saw that they’re planning something called “White Pumpkin Pie M&Ms” for this fall. White pumpkin pie? What even is that? I can only assume that these M&Ms will be meant to taste like a pumpkin pie made from one of those weird white pumpkins you occasionally find hanging around farmers' markets like Ghosts of Pumpkins Past. I’ve never seen anyone buy one, much less pie one and I’ve certainly never tasted a white pumpkin pie. Actually, now that I think about it, M&Ms could be on to something here. I mean, if you’re going to do a fake flavor, maybe your best bet is to make one that no one knows what it’s actually supposed to taste like in the first place. It’s kind of genius. Or maybe it’s just weird. I don’t know. I’m in no position to criticize since I keep falling for their marketing ploy and buying and trying as many of their limited edition flavors as I can get my hands on. 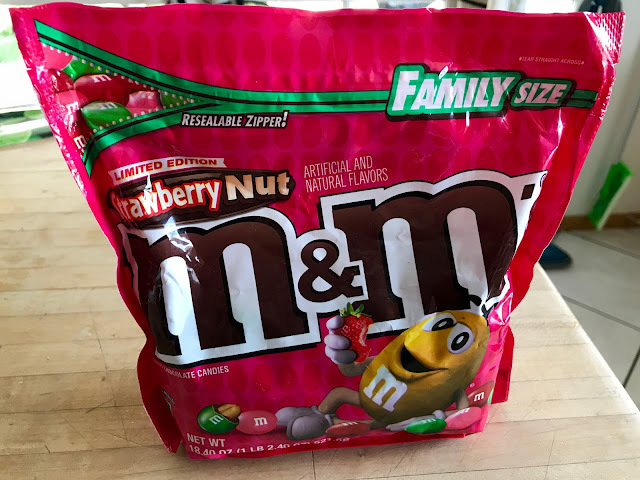 For example, my local Ralph’s only had the big size of the new Strawberry M&Ms so I grabbed it and growled even though I had no idea if they were any good or not. And how could they be good, really? Strawberry and chocolate aren’t a bad mix and I like peanut butter and strawberry jelly but strawberry/chocolate/peanut M&Ms sounds like some kind of unholy candy Frankenstein. Before you get a mob of villagers together and pass out the torches and pitchforks, though, give the Strawberry M&Ms a taste. Actually, give ‘em two tastes. My first bite didn’t do much for me -- in fact, I thought it kind of tasted like someone had put an M&M candy shell around an old piece of Frankenberry cereal -- but the flavor grew on me and now I’m craving the damned things. I may have to get another one of those big bags before they’re gone forever. 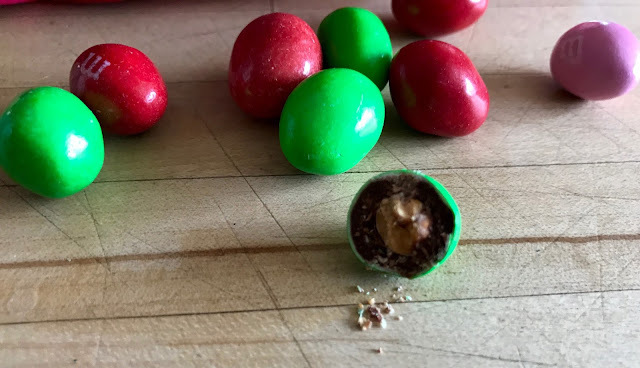 Turns out Strawberry M&Ms aren’t some Frankensteinian abomination after all. But they just might be the devil.